The RV Doctor: Pre-Sale RV Inspections Are Crucial! Pre-Sale RV Inspections Are Crucial! Indeed Jake, any certified RV service technician could perform a set of procedures called a pre-delivery inspection (PDI), prior to consummating the sale. Look for a professional shop or dealership in your area once you settle back here and before you commit. 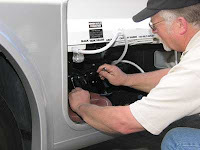 A PDI checklist is used by the pros for inspecting and testing all the systems and components on any RV prior to the sale. Even if you must pay for this service yourself, at least you’ll know the true condition of that RV. But I contend the cost should be shared by both the seller and the buyer if the deal is between two individuals. If you buy from an established dealer, typically they will perform this service as part of the deal anyway. Or at least they should. Always retain copies of the PDI form. All RVs should meet the standards of the NFPA 1192 and the National Electrical Code (NEC). Be sure your inspecting technician or shop is familiar with these documents. PDI check-off lists can be quite comprehensive (as they should be!). You'll find some online if you do a search. Any discrepancies found during the PDI can then become bargaining chips for price negotiation or could outright negate the sale in some cases. Use it to your advantage!